Last term, my 14 year old daughter entered a couple of reading Challenges at school. 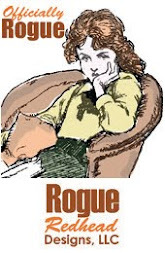 For one of them, she had to read 12 books in different, listed genres (!) She completed the task, so I treated her to a little 'vintage' shopping at the weekend and made her this for her to remember her achievement by. Proud of her? Oh yes! The lovely lady, sentiment and the print on my torn heart are from Rogue Redhead Designs - and what marvellous stamps they are too! Lush red rubber that stamps beautifully, Yum! 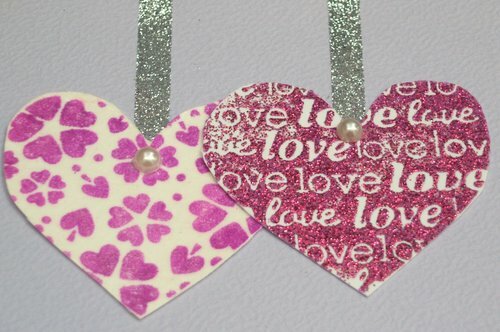 The heart has a good splash of Glossy accents and a sprinkle of glitter. My lady looks like she is day dreaming as well as reading and this reminded me of Fontine's song from Les Miserables. I used to be a Wardrobe Mistress in the Theatre, so adore my Musicals! I am entering this card into The Blogger's Challenge - Texturise IT! I 've been having a major sort out of my craft supplies and found bits and pieces I wanted to use up - like peel offs. 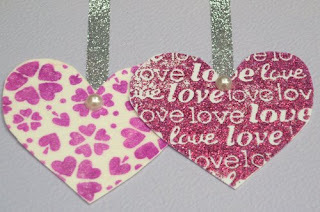 I stamped, embossed and cut out 2 hearts and then created 'ribbons' for them to dangle from by using double sided tape which I coated with glitter. That is such a simple but effective technique. Gold, lots of Gold... and then some, with bells on! I'd never made anything using a great deal of gold. Well, I have now. Tonight I used the lid of my embossing powder, pushed it in the stamp pad and embossed circles on the tag - it was really good fun! 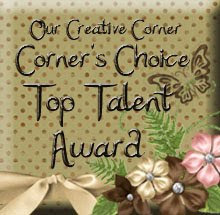 I used several different shades of gold embossing powders. The little hearts at the bottom used a variety of effects learnt during the 12 Tags of Christmas and were cut out freehand. I had so much fun making this! This is the first time I have created a larger project using some of the techniques that I learnt during the 12 Tags of Christmas and I was really pleased with the results though the photo's have not picked up all of the details too well. 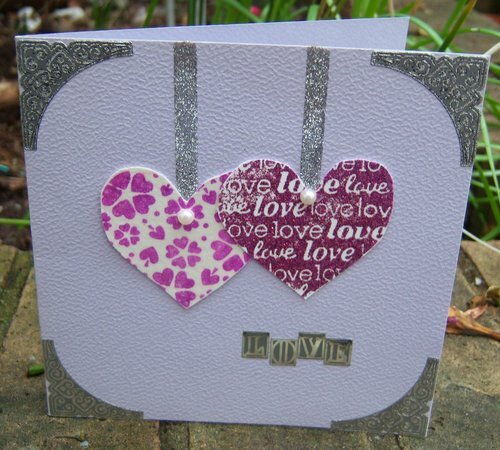 I used the triple embossing techniques from Day 8 as well as the water splatting technique. Creating the background -Tempus Fugit! I cut a tag from a 12x12 sheet and then, stamped and embossed Tim Holtz clocks. onto the paper and stamped 'Tempus Fugit (time flies) too. I stamped my wistful lady using Rich Cocoa Momento Ink. and painted the lips and eyes with Worn Lipstick and Broken China Distress Ink, which were then covered in clear embossing powder and heat set. I covered the whole image in Clear Distress Embossing Ink and embossing powder and embossed a second time. I repeated this process again, this time,,, tapping hard to remove the the excess powder into a bin prior to embossing. I used a blending tool and Vintage Photo distress ink and worked it in a circular motion (quite hard) over the whole image. The Distress ink seeps into any gaps - Neat huh? Here is a link to HRH T!m's instructions for this great technique... 12 tags of Christmas The eyes and lips are more raised than the background image, which looks really cool. and I shall call him... Bert! I stamped the Tim Holtz gentleman (who I shall call Bert) and then triple embossed him as well, this time making lots of cracks in the glaze by gently bending it - great fun! - this could be the new bubble wrap for me! I dropped a few dots of the distress inks I had out onto this image between the embossing stages. I repeated the process on the Hot Air Balloon and also embossed the Portabello Road Postcards and The Tim Holtz Eiffel Tower image. Red Letter Day - or Letters Wrapped in Blue? I have challenged myself to make 20 mini books from my existing stash to be sold for the Charity so lovingly run by 2 of my colleagues at the college where I am a lecturer. Once I have done these, I have promised myself to move onto Greetings cards, also for the same charity. The books and the cards will be very simple as it is the start of term and I have lots of preparation work to do, but that's okay! I used images I stamped and cut out ages ago and die cut some flowers. I used DCWV card for the covers and the details were highlighted with Glossy Accents. I spent most of this evening looking through my own craft supplies - surveying my little kingdom as it were. I got quite excited by some of my finds, especially the remainders of some old Basic Grey and K&Co pads... the crafting industry is as fashion led as the fashion industry itself and it is always tempting to desire the newest items, leaving some of us with lots of unused goodies that we loved once but have squirrelled away and now neglect. Maybe, just maybe... in these austere times, one of the craft companies should consider offering a paper pack (in addition to their normal ranges) with less duplicate sheets and more designs? Imagine for example... A best of Basic Grey pad? 6x6, 36 different pages, I'd bite their hands of for one! They could trawl through their own back catalogues and produce different volumes - colour coordinating ones, mmm... what a nice thought! I used a Sizzix page and cut 20 pages from photocopy paper as well as a front and back cover. I'd sanded the coredinations card for quite a while before I realised it WASN'T coredinations at all but in fact had a white core, but I liked the effect so I kept going. I would have realised sooner, but was so engrossed watching Moulin Rouge (I love everything about that film) that I wasn't really concentrating! Yay, slacker! 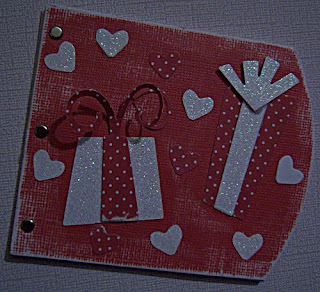 I die cut some Quickutz presents and punched some tiny hearts out of scraps of glitter card and dotty paper and then messed about with them till I liked the layout. I used long ended brads to fasten it all together and covered the ends with and extra strip of white glitter card, it made it look very neat on the back. 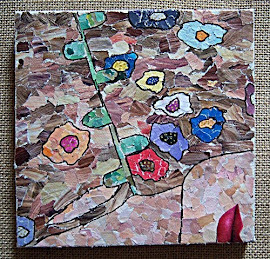 I am going to make more of these for a charity project I support at my work - it cost pennies, but I like it. When my friend suggested I complete this challenge, I was struck by both the brightness and number of the colours, hmm - was this going to be a challenge too far? I don't tend to use this many colours on a project and rarely go this bright. Still, I decided to have a go. Ah, back in the day, hugely influenced by this all female group, I remember going out at night in Brighton with friends, wearing dungarees over a vest, with a fetching scarf tied around my head and lots of red lippy, thinking I was the bee's knees - Well, you never know!! 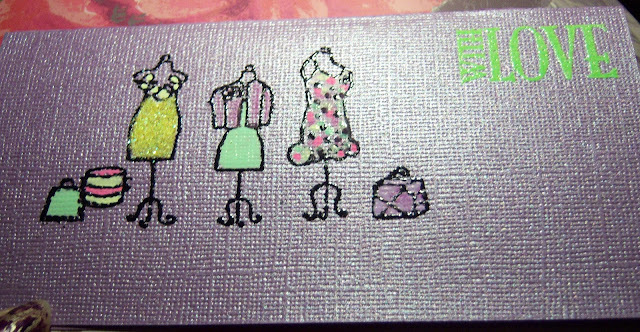 Any hoo, before I get stuck in the 80's...After folding a piece of Coredinations jewelled card, I stamped and embossed a Hampton Arts stamp and coloured in the images with Sakura pens. I added a stamped sentiment and embossed using a lime green embossing powder. A smattering of Bumblebee glitter and I was finished - don't worry, tis only the name of the shade of glitter... no bees were harmed in the creation of this card! Clare Curd - New Fiskarettes Ambassador UK - Good Luck! Back in the day, before my old tabletop computer decided that it would celebrate the event of getting online... by switching itself straight back off, I used to visit the Fiskar's UK website and joined the Fiskarettes. Now I can get online (and stay there!) I've been popping in and have posted a couple of bits and pieces, big changes afoot, the site has been closed for a short while and is currently mid revamp. Note added 10th January 2012, a few people have been asking me about this stamp, it is a striking image isn't it? 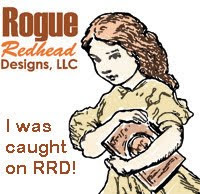 Well, 2 good people whose blogs I visit daily, won, in Sir Tim of Holtz's amazing 12 Tags of Christmas awards - they are both great bloggers whose generous comments have encouraged my own fledgling blog - and I was so happy and proud for them. Do drop by and give Sue and Anita a wave! 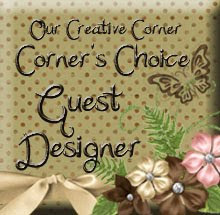 In the midst of all that excitement (happy emails wending their way back and forth across the pond) I checked updated posts from the blogs I follow and comments on my own site and found to my joy and amazement the winner of a very gorgeous item - a vintage crafting CD on a beautiful vintage blog was... ME! Huge excited, happy thank you to Julie. (Oooh, the very word 'vintage' sends a thrill up my spine) this is the loveliest site (and there is a very cool sister site too) so, when you get back from Sue and Anita's, why not drop by? I then used up more old and new scraps (another free stamp, this one from my beloved Craft Stamper magazine) some brads I found in a remainder bin pre Christmas and a Sizzix page die to make this book. After crafting in all the bright colours over Christmas, it was good to use a starker colour scheme.